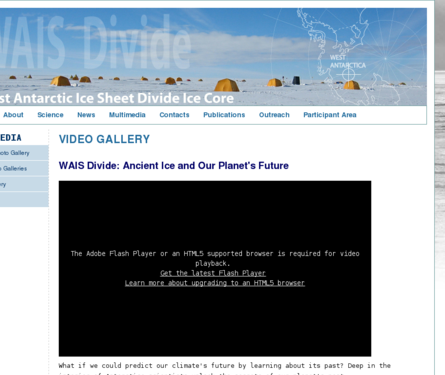 Use as a short intro to lesson on ice cores. This is the first in a three-video series, which also includes "Life on the Ice" and "Modeling our Future Climate". Video shows the process of collecting ice cores. No data is shown or discussed. Comments from expert scientist: The video explains the importance of climate change, and the usefulness of scientific study to understand past climate for the purpose of becoming better at predicting future climate. The focus is WAIS Divide and the ice coring operations taking place there. The video explains how ice layers accumulate and how pockets of air form within the layers. Explanations of how the cores are collected and logged are included. The science is accurate, but does not go in-depth. Excellent quality. The images and video are high resolution and suitable for projection in a classroom.